Welcome to Portugal. The border is in the middle of the bridge in the background, hence the 1 km sign. some friends of his, talking about the trip and different places we had been. We also met Rui and Rosa, a local couple, who took us to the Moto Club Faro clubhouse, and introduced us to some of the members. What a fantastic place, the clubhouse is awesome, with a bar, stage, outside beer garden, shop, offices, and dance floor downstairs, while upstairs there are 3 dormitories, two sleeping 6 people, and another for a couple, complete with showers, toilets, and a kitchen. The beds are are for travelling bikers, and available free of charge. 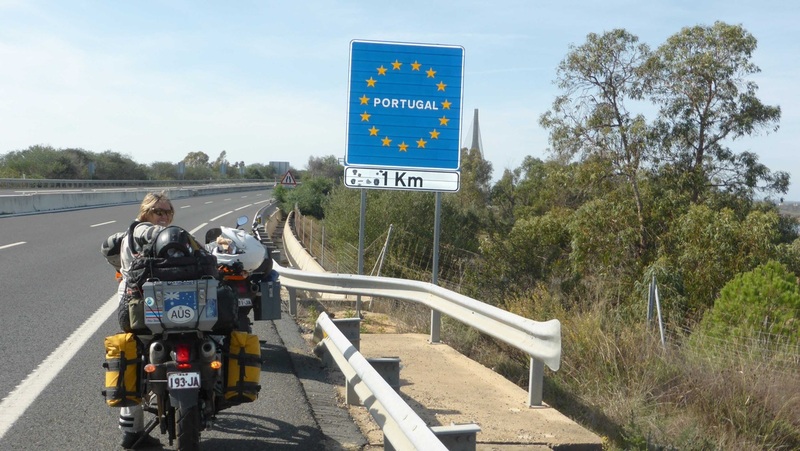 They host a rally every year, last year there were about 40,000 bikers from all over europe attending! At one of them, one of the bands was AC DC!!! After our holiday at Albufeira, we rode over to Sagres, near the south easterly point of Portugal, and checked out the surf there. We sat in the sun on the beach watching the surfers, and lunched on some food we bought from a nearby supermarket. There we met Heath and his wife. Originally from Cornwall, they both surf, and moved down for the weather a few years ago. Heath spotted the bikes, and came for a chat with us, he has a XTZ660 Tenere himself. We booked into a hostel, but the GPS couldn't find the address, a lot of asking the locals finally located it. A fairly early night, after a dinner of more supermarket food. We had packed up and left by 10.30, (early for us), and rode out to the lighthouse at Cabo de s. Vincente, on the south easterly point of Portugal. While it wasn't raining, there were showers around, and it was cold riding, so the liners went into the jackets. From there the coast road took us north, and we took a few little deviations took look at some beaches on the way. One of them was our lunch stop, a lookout from some cliffs, where the leftover kebab, cheese and ham kept us going until we reached Santa Luzia, our destination for the next week. It was home of Alfredo and Tina, our first Workaway hosts, where we would work for our food and accommodation. gave me a hand to adjust the tappets on both bikes, which were overdue to be checked. Thanks again for that, Gerhard! If anyone is in Holland and needs some work done on their bike, give the guys at v.Sleeuwen Motoren a call, I'm sure they will look after you. By mid next year they will be in their new bigger premises too. Gerhard leaves some bikes at the farm, and the guys fly in from Holland for a few days and use it as a base to ride some of the great roads in the area. Carly, a young english girl, was also staying at the farm, and it was her birthday on the 7th, so we all went out for a seafood lunch at a great little restaurant on the coast, a top day out. The weather wasn't being kind to us, and our original plan of riding up the coast of Portugal was rained out, so we decided to head back to the warmer drier weather in Morocco until we left to go back to Oz for Xmas in December. Riding back to Faro was the first step, so we skirted a lot of rainclouds through the mountains, and arrived in late afternoon. The road would have been great if it was dry, good smooth bitumen with big sweepers. That night at the clubhouse there was a big party, with 30 or so members of the Firebirds MC arriving from Belgium. We were kindly taken in and given a bunk in the dorm, and invited to join them for dinner as guests. A top night followed, the meal (including oysters), was delicious, and the band kicked in and played until around 3.00 am, then other music followed, I believe it went until about 5.00am. We didn't make it that long!!! I remember 2 other guys coming in to the dorm around 5.30, but we went back to sleep until around 10.00am. There were some sore heads around then........ We were heading back to Spain, so left at around 2.00pm for Sevilla, arriving damp, freezing cold and in the dark at the Ibis Budget Hotel again, to a nice warm shower and an early night.